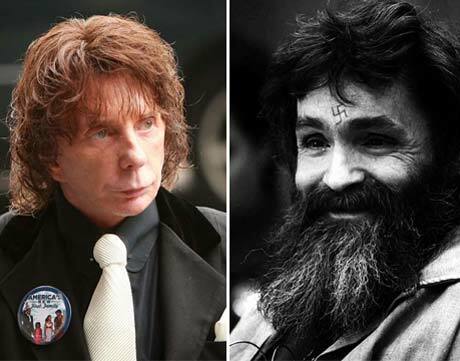 If you thought last week's reports that Charles Manson and Phil Spector may be doing a little jailhouse rock were too good/bad to be true, it appears they are. According to a California prison spokesperson, the two celebrity inmates have never had any sort of contact whatsoever and the rumours that Manson has reached out to Spector to collaborate are rubbish. In an interview with Paste, Terry Thornton, spokeswoman in the Office of Public and Employee Communications at the California Department of Corrections and Rehabilitation, said the two prisoners aren't even in the same facility, with Manson being locked up in Corcoran State Prison and Spector in the California Substance Abuse Treatment Facility. "They're totally separate," Thornton told Paste, adding that the rumours that a guard had passed Spector a note from Manson were untrue. "That would be misconduct, and allegations of misconduct are investigated," she said. "So that particular allegation was investigated and showed that no employee brought a note to inmate Spector, and that inmate Manson didn't offer the note." However, here's the likely reason why such a crazy tale spread like wildfire across the internet: Spector did receive a note, although not from Manson. "Probably another inmate, perhaps playing a prank, did that," Thornton said. "Unfortunately, the note was destroyed, but it's very likely that it was just another inmate who signed it as Manson."